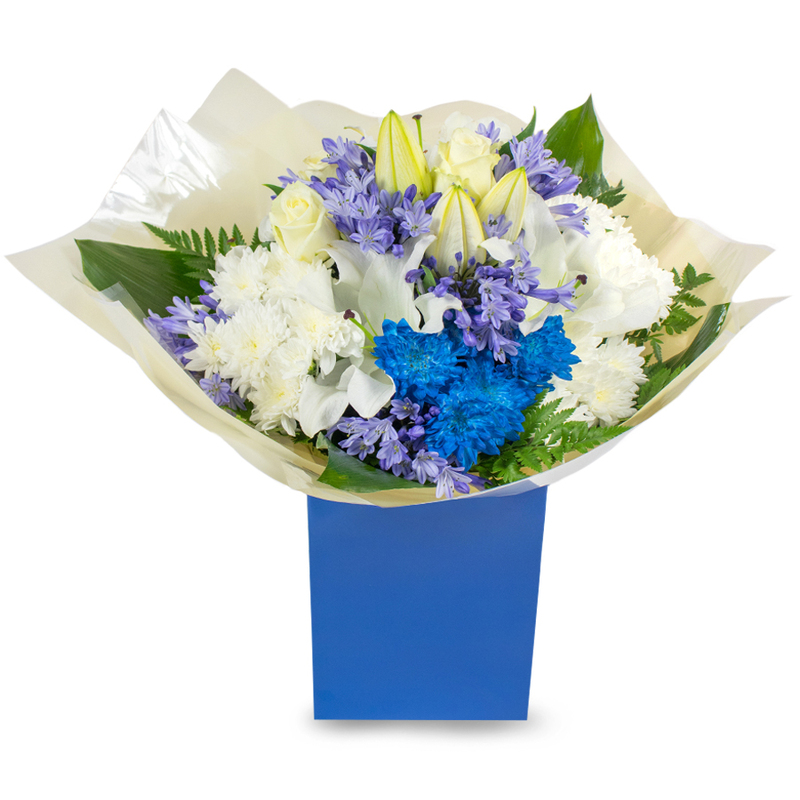 Abundant bouquet created of freshly cut blooms in white and blue. 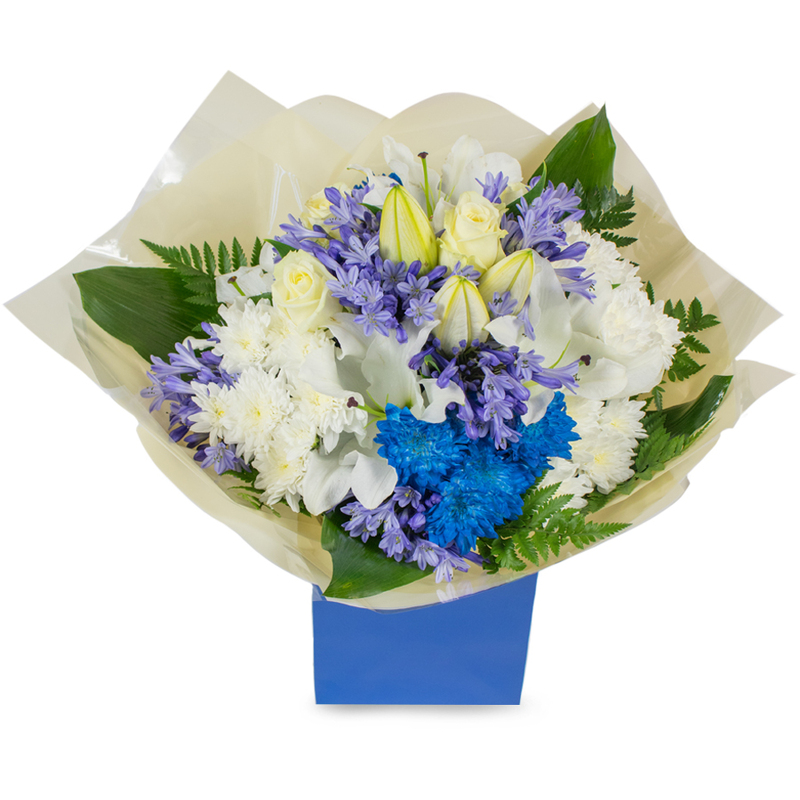 This majestic combination of white roses and lilies, blue hyacinth, white and blue chrysanthemums is a lovely way to make the day of someone special and bring joy and unique beauty to their home. A perfect gift for a newborn baby boy. Amazing flowers and amazing service! Definitely my favourite online florist. No one delivers flowers more magnificent than you do. Your florists have never disappointed once! Fantastic bouquet! The sweet fragrance of the hyacinths make it even more amazing! Called the team to ask if they could arrange a bouquet for my wife's 50th birthday and they responded very quickly with a great offer. Thanks! Good company to order flowers from. They listen to your needs and arrange the perfect bouquet for any occasion. Thanks a lot for your help. Needed flowers for a baby boy and came across this florist. I truly liked the blue colour and the selection of flowers. Delivery was made on time and the flowers looked amazing. Such a wonderful arrangement! The order was processed easy and quickly and the flowers arrived early in the morning. I was very impressed by the way the flowers were arranged and couldn't wait for my sister to receive them. Thanks a lot Handy Flowers!